- Overall Load Capacity: 3800 lbs. The Tennsco 60" W x 30" D hardwood top workbench is ideal for factories, shops, labs, garages, and more. Work surface is 1.75" thick and made from laminated hardwood that resists warping. Resandable surface is ideal for delicate machined parts and dies. 14 gauge stringer connects legs together for added stability. Holds up to 3800 lbs. Ships ready to assemble. 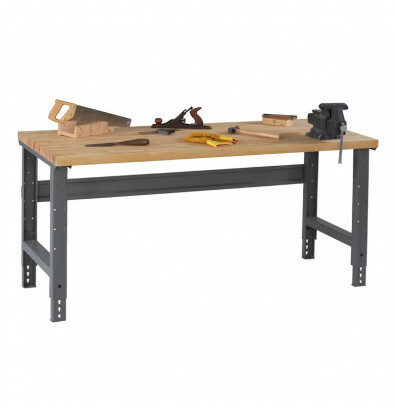 Workbench has legs that are adjustable from 27.875" to 35.375" and adjust in 1.5" increments to adapt to your requirements. The knockouts in each leg are designed to receive duplex electrical outlets to power your workbench (total of 8 individual outlets). Holes in feet are predrilled for bolting to floor. With a complete selection of optional addon components, including side and back stops, risers, stackable drawers, cantilever accessory units and lower shelves, this highly efficient Tennsco hardwood top workbench insures maximum productivity in the workplace. See "Recommended Accessories" on the right sidebar for these options. Laminated hardwood in butcher block construction resists warping. Stringer connects legs together for increased stability. Adjustable legs conform to work height requirements. Knock-outs in each leg accept duplex electrical outlets. Holes in feet allow for floor bolting. Overall Load Capacity: 3800 lbs. The following accessories provide additional features for your workbench. They are available on the right-hand side in the 'Recommended Accessories' section. Stackable Drawers - provides additional storage with optional lock. Can be mounted on top or underneath workbench. Side and Back Rail Kit - prevents parts and small objects from falling off the side and back of your workbench surface. Workbench Riser - provides storage and extra workspace elevated above benchtop. Workbench Pre-Wired Electronic Riser - provides storage and extra workspace elevated above benchtop. Workbench Electronic Riser - provides storage and extra workspace elevated above benchtop. Lower Shelf - provides extra storage space and convenient access to tools. Caster Kits - add mobility to your workbench with an optional caster kit. Cantilevered Accessory System - provides a variety of convenient storage options for your workbench. 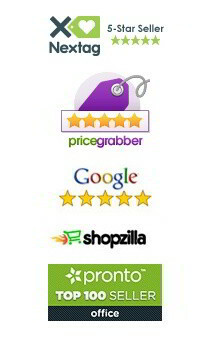 The list of recommended accessories are the most popular addons. Additional accessories and addons are available. Please contact Customer Service for assistance. Great workbench that can be decorated into a desk. Easy to put together, well packed, and quality components built in the USA. First shipping - parts very well packed, no damage, strapped to a pallet. Second workbench - very nice butcherblock top, all metal pieces had quality paint job/finish. Lots of extra screws and fasteners. Workbench is solid and stable, I'll be using this bench for many years. Excellent quality workbench. Wood top is well made and the metal legs are heavy, of good quality and a high quality painted finish. Can't say anything bad because it's all good! Even delivery was as promised. Definitely would buy another one if there was a need to.